Our patient care spans far beyond the services offered at our practice. 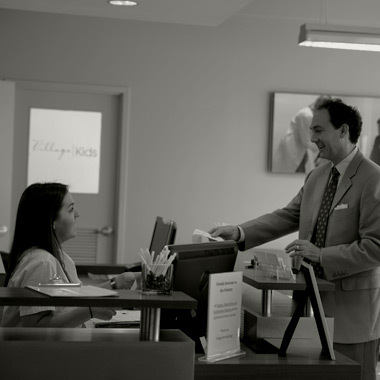 At Village Dermatology, every measure is taken to ensure you feel at home during your visit and absolutely confident as you walk out the door. Simply request an appointment below. For more information, please visit our new patient section. Thank you for choosing Village Dermatology. We consider it an honor and a privilege to treat you, and look forward to building a relationship that achieves your goals for healthy, beautiful skin. Please call our office at 205.877.9773 to request an appointment. Upon initial contact, we will provide you with a login and password to access our patient portal, where you can fill out all required forms prior to your office arrival. You may also update them in the future as an existing patient. If you are unable to complete the online registration, please click here for printable forms. We ask that you bring with you any former medical records related or beneficial to your visit. You may also fax them to us at 205.877.9775. Please click here to download and print our Patient Authorization To Release Medical Information Form. We will send you a reminder text 2 days in advance of your scheduled appointment. Please notify us at least 24 hours prior to your scheduled appointment if you need to cancel or reschedule. If you miss the appointment without prior notification, your account is subject to a fee. Please contact our office for your username and password. You are encouraged to reset your password upon initial login. Klara is our communication platform that allows you to communicate with us more efficiently and effectively: say good-bye to phone tag! You can use Klara on your smartphone, tablet or computer, and it is free for all patients. There is a free app (iOS only) available for download, but it is not required. With Klara, your information is secure and private, and it is 100% compliant with HIPAA-standards. What do I use Klara for? You can use your Klara account to reach our staff regarding appointments, general questions, non-urgent medical concerns following a recent appointment, refill requests, benign test results and more. Please note: Klara is not a replacement for in-person medical consultations or appointments. Use of Klara should replace cases where phone or email would be used. You can message us anytime, but please understand that Klara messages will be read and handled during business hours only. Messages sent after 3 PM on weekdays and anytime on weekends or holidays will be handled the next business day. Klara does provide “read receipts” so you can see when your message was read by staff. Once you receive your invite, you must click the link in the message to set up your password and activate your account. You will receive a notification every time you have a new message waiting for you in Klara. You can tell Klara if you prefer communication via email or text in your settings. What if I have a problem with my account? For any additional issues or questions that arise regarding your Klara account, please send an email to support@klara.com.